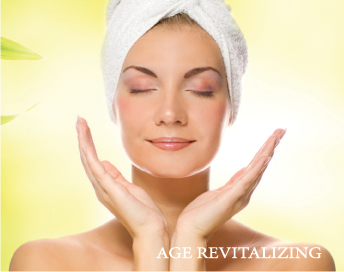 This Age Defying treatment is designed to promote radiance and youthfulness from deep within skin. Signature techniques and potent organic ingredients are utilized to increase elasticity and firmness, leaving the skin beautifully textured with a brilliant glow. Whether skin is in the beginning stages of visible aging or needing deep repair, this treatment is appropriate for all adult complexions. The Age Revitalizing Facial incorporates anti-aging ingredients and effective anti-oxidants such as Acai and Maqui, aiding with both immediate and long-term cell regeneration. Additionally, special techniques are incorporated for dramatic, enhancing results.